Your feedback is very important to us. We'd love for you to share your CS Tree experience with your friends and family on Facebook, Google or Nextdoor. Below are some recently received reviews. Steve & Chris have helped us with tree issues large and small numerous times over the past twelve years.They have always been professional, well trained and extremely safety conscious. They do what they say they are going to do. The latest example involved a tree hanging over a driveway with a luxury car immediately below (that could not be moved). The tree was removed efficiently with not a scratch on the car. A previous tree problem required the use of their 100 ft. mobile crane, in our difficult to enter and extremely narrow driveway! It has been great to see their company grow and prosper over their years, no doubt due to their excellent customer service. 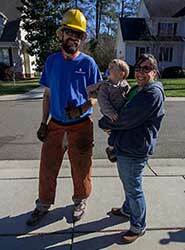 Co-founder Steve with good friends Kirsten and Alex after a successful crane job at their home. January 2017. Photo by Bob Spaziano. Steve, Chris and the crew are the most professional team I have worked with. I am new to the area and needed some trees cut back from the house. They did a fantastic job. It doesn't get better than this. These guys are awesome! Took down and grinded 4 stumps that were Bartlett pear trees, Took down and grinded the stumps of 5 crepe myrtles. Also, pruned a River Birch. All of this in less then 3 hours!! They cleaned up beautifully, and I could not be happier! Hire this company and you will not be disappointed. Great job.Quick and efficient. I have used them before and have been very satisfied. Plan to use again in the fall. They did an excellent job removing multiple trees in very tight quarters. Did not damage any other trees or landscaping around them. We have contracted CS to perform tree work at different properties under a variety of different circumstances. Whether extracting a large tree from an seemingly inaccessible place or quickly tackling and removing storm damage, CS Tree Services delivered punctual and impeccable service at a very reasonable price. They were quick and efficient. The prices were good and the scheduling was easy. Just in case you don't want to read all the details, here is the bottom line: CS TREE SERVICES, INC., IS AWESOME! DO NOT HESITATE TO HIRE THEM! Steven Kurtz, came out to our house not once, but again at my request, to discuss all of our needs to clear an area for installation of a pool. But, while here, we walked around and discussed some additional pruning, etc. I asked him to come back because we were concerned about a couple of large oak trees that we really wanted to spare and he gave us some excellent advice and we made a few changes to the original plan. Once our HOA approved our project, I let him know and he scheduled two days for our project. On the scheduled day, a crew of about 7 arrived first thing in the morning along with a large crane, a chipping machine, a truck to haul away logs, some smaller pieces of equipment, and tools including safety gear and communication devices. It was clear right from the start that each member of this team knew what their role was and played it well. Impressively well. My husband and I watched from the deck as one of the crew was hoisted up to the treetop by the crane, attached the tree to the crane, then lowered back to the ground to saw the tree off its roots. Then the crane lifted the trees one by one up over our shrubs and crape myrtles to the road where the treetops were fed into the chipper and the logs cut and loaded onto the truck. While some were engaged in this activity, other crew members went about the business of pruning, reducing, and removing other trees and shrubs. Near the end of the clearing we identified 4 additional trees to be removed and they took care of it. All of this went on throughout the day, at times during periods of rain...and sometimes the rain was more than a light rain! We thought maybe they would quit and return the next day as 2 days were originally scheduled for this job, but they just kept on working. They only took one short lunch break. The job was done in one day, and done exceedingly well. One holly tree at the front of our house was "reduced" in height and did not look very good...aesthetically speaking. We thought maybe it still needed some shaping that was overlooked...which, given the amount of work, the weather, and the location of this tree, was completely understandable. I emailed a photo of this tree to the owner and he replied (quickly as always) that the tree would now fill out at the top and ultimately look better. But, the next morning, a crew was in the area and, because they saw my email, they stopped by to check with us to make sure we were happy with everything. That, in our opinion, is the best customer service we have ever experienced...and we've dealt with many, many contractors over the years. These people are highly professional, friendly, and easy to work with. I would recommend them to anyone and CS Tree Services will be our go-to for any and all tree needs.